Before we get into this month’s 12 Months of Thrifting prompt, I have a thrift confession (thriftession?) to share: shoes are some of my favorite things to thrift. The idea of buying secondhand shoes may cause many to pause but ask any veteran thrifter and I bet you they will tell you the same. Here’s why: where else can you find brand new or like-new shoes for about $3? I follow a very strict checklist when I’m shopping secondhand shoes: first, my priority always goes to brand new shoes, and there’s certainly no shortage of never-before-worn shoes at Goodwill. It actually amazes me how many brand new shoes are donated to Goodwill on a regular basis. Secondly, I always check the soles. If they aren’t in excellent condition, I pass. I always clean shoes with disinfectant spray or wipes. Goo Gone also helps clean the soles and remove any gunk or stickers. By following this checklist, I’ve been able to collect dozens of shoes from Goodwill that have lasted me years. $3 for a pair of shoes that will last four years? Sign me up. This is why you saw flats on the 12 Months of Thrifting schedule not once, but twice this year. Back in April we prompted you to thrift a pair of colorful or printed flats to add a pop of color to your outfit. This month, we’re encouraging you to hunt for a pair of black ballet flats. I like to think of black ballet flats as the “vegetables” of my wardrobe. They serve such an important role in bringing everything together and they go well with practically everything you own: from workday to play day. Wear them with a pair of ankle jeans, cardigan, and tee in the fall; with a pencil skirt for work or with a summer dress to run errands. Really, the possibilities are endless. 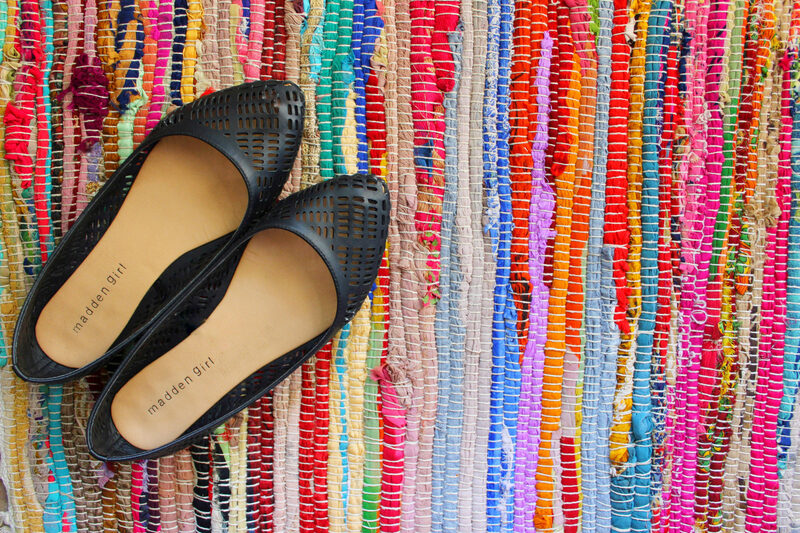 Your black flats don’t have to be boring either! You can spice things up with a pair of pointed-toe flats, perforated flats, strappy black flats, or a pair of faux suede flats.